Each franchise is an independently owned business with an entrepreneurial spirit, but what makes The Dwyer Group model unique is having so many brands based out of a single corporate location. This allows structure and synergy to flow through day-to-day operations. The company has had key accounts that only utilized one service brand, but as other needs arose, they funneled all of their solutions through Dwyer. “Our techs also take pride in the level of service and commitment they provide – which are a core set of values,” says Glenn Lewis, Director of Key Accounts. 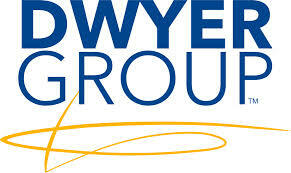 The Dwyer Group requires all new franchisee’s to attend a full-week of training at the firm’s corporate headquarters. During this week, Dwyer stresses the importance of branding consistency in image, service and marketing materials. Another part of the training process is an extensive training program to learn both ServiceChannel’s facilities management software platform and the Fixxbook contractor directory. Founder Don Dwyer, Sr. created the Veterans Transition Franchise Initiative (VetFran Program) in 1991 after the Gulf War. The VetFran program is a voluntary effort of International Franchise Association (IFA) member companies to encourage franchise ownership by offering financial incentives to honorably discharged veterans. It is now recognized throughout all industries. In addition, The Dwyer Group has a scholarship program for women and awards six $1,500 scholarships each semester that recipients can apply at a trade or technical school of their choice for any of eight trade specialties: HVAC, plumbing, electrical repair, glass repair & replacement, appliance repair, restoration, painting, landscaping, residential cleaning or handyman services.